At our eco farm in Brazil we apply bioconstruction, agroforestry, organic farming while following the permaculture philosophy. We welcome volunteers to join Eco Caminhos, offering an unforgettable experience of living, working, and learning in the beautiful mountains of Nova Friburgo. Long-term volunteering is an excellent opportunity for people who are seriously thinking of changing their lives. Join us if you want to spend time in nature, produce your own food, build your own bioconstruction house and generate your own energy. We offer a new approach to volunteering and sustainable lifestyle. People are at the centre of Eco Caminhos and we need highly motivated, intelligent people to join our cause and team. we help people to find ways to sustain themselves by giving them the freedom to start up their own income-generating project. We want to create complementary mini-eco-social-businesses based on the exchange of knowledge, services, and products. Read more about our community philosophy here. The 3 Picos natural reserve in the mountains has incredible flora and fauna. What is Expected from a long-term volunteer candidate? First of all to qualify for the long-term programme you need to commit longer. We give preference to people who can stay for over 1 year. We accept people for shorter periods with a minimum of 3 months but this depends on your skills. In case your skills are not in this list but still want to join the long-term programme you can still apply. In case you lack work experience or lack the time you can start off in our short-term volunteer programme where you will have 3 months to learn a wide range of skills. After this period you could be invited to the long-term programme, depending on the work you have shown and how you function in our group. Once we receive your application and we have analyzed it, if you qualify we will invite you for an interview. What will your average day be like? Long-term volunteers who participate in the full-time programme will work 40 hours, 5 days a week. Volunteers work in our bioconstruction, organic farming, ecotourism and/or other projects. After your workday and on weekends, you are free to do as you please. Many of our volunteers plan their weekends to explore Nova Friburgo or Rio de Janeiro. Others prefer to enjoy nature by relaxing at the volunteer house, go to the waterfall 50 meters from the volunteer house or doing a hike in the mountains. Once a week the Eco Caminhos team unites in the evening to socialize. During these volunteer nights, we usually cook together or make a fire outside, watch a movie or play a game. We also welcome other suggestions and initiatives. What matters is that we spend time together. Rooms for 2 to 3 volunteers. At the Eco Farm we enjoy preparing delicious food with products of our own garden. There is the option to take a bus in Rio de Janeiro. To do this you can take a line bus from the airport to the Rio bus station and from there take the bus to Nova Friburgo where we can pick you up. Now if you would like to guarantee your safe and comfortable arrival, our trusted driver can pick you up and leave you at the Eco Caminhos doorstep. He will wait for you in the arrival hall with a small name plate. The driver charges only R$ 400 (approx 110 US$), a very sharp price for Brazil. We can also arrange for you to be dropped off at a specific location on your day of departure. You start off in our free volunteer programme, where you are offered accommodation, food, and Wi-Fi. 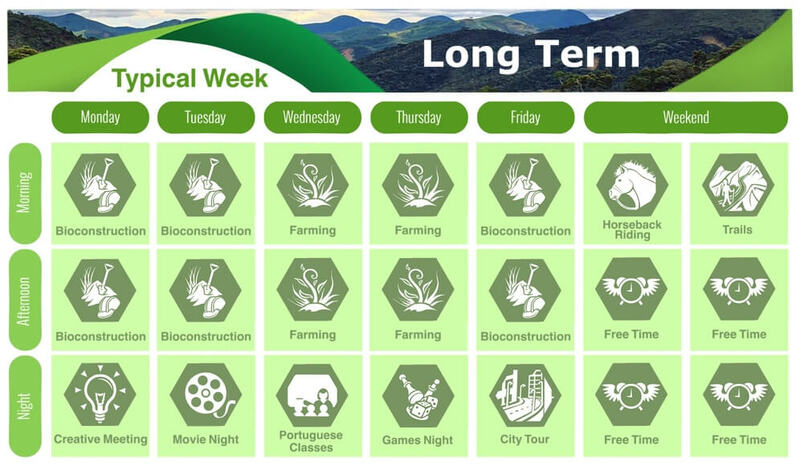 You participate in a 40 hour routine in the projects that are available at the time (bioconstruction, farming, maintenance etc). During this period, both the volunteer and Eco Caminhos get to know each other. We believe working in existing projects allows us to see if you can adjust yourself to the team, do hands-on work and keep your motivation up. Each month there is an evaluation during which the volunteer and the Eco Caminhos team evaluate one another. After 3 months there is a final evaluation, where both sides decide whether they want to continue working together and commit to at least the end of the year. After a “go” from both sides to go for a period of at least 1 year, the volunteer continues to participate in excisting projects 4 days per week en work 1 day per week on his/her project. The project can be anything that fits within the vision of Eco Caminhos (preservation, social impact, education, farming, bioconstruction, etc). Very limited resources are available for setting up projects. This means that candidates either need to develop projects that require very little initial investment or raise their own funds. At Eco Caminhos we have a weekly creative meeting where projects are discussed and we all try to collaborate. Projects can be individual or in group depending on the individual’s preference. We provide ideas for volunteers or volunteers can come up with their own projects. The volunteer can request a 2nd day to work on the project once the volunteer wants to commit for at least 2 years and the volunteer can convince the director that there has been made progress and that the project can be successful. In this phase, you will be invited more in the decision-making process of Eco Caminhos. You are able to vote for changes in the organization. The focus will also continue on your project with the intention to generate income. Each project is different and terms will need to be negotiated. The general idea of Eco Caminhos is that the people who set-up and run projects will be able to keep 50% of the profits in the long run. The other 50% is reinvested in Eco Caminhos to pay for the operational costs, invest in bioconstruction, agroforestry projects, and infrastructure from which all benefit. In the beginning, this % could start with only 10% and gradually increase while the volunteer grows in the project. Once a volunteer is able to self-sustain It is expected that as soon as a candidate is able to provide for him or herself, he or she starts to live independently. At this stage, it is time to get your own accommodation either rented or in case possible buying your own property and with our help build your own bioconstruction house. With full independence, you stop being a volunteer and we work as partners. In case the cooperation with the management of Eco Caminhos flows well and we have established a trust relationship, there are many possibilities: 1) you become the manager of one of the main Eco Caminhos projects, 2) you get a general profit share 3) you take part in important and strategic decision making. Participate in volunteer nights including board games, cinema, and campfires.